Previous findings showed that the microRNA (miRNA) expression profile of miR‑151-5p, miR-1290 and miR-451 measured at diagnosis in bone marrow (BM) aspirations can predict risk of relapse in pediatric precursor B‑cell acute lymphoblastic leukemia (B-ALL) patients treated according to BFM-based protocols and DCOG protocols (Avigad et al., Genes, Chromosomes & Cancer; 55:328–339, 2016). Confirm miR-151-5p, miR-451 and miR-1290 expression profile measured in BM aspirations at diagnosis, as a prognostic factor for B-ALL and standardize the classifier on a new platform method for measuring miRNA. The miRNA expression was measured in BM samples from a sub-cohort of B-ALL patients (n=272) from the Associazione Italiana di Ematologia Oncologia Pediatrica (AIEOP) enrolled in the AIEOP-BFM 2000 study under inform consent (Sep-1, 2000 to Jul-31, 2006). Patients' clinical status was unknown to the lab. A fixed amount of synthetic non-human miRNA (Ref-miR) was spiked in total miRNA extracted from BM samples before reverse transcription (RT) for quality control. RT was performed with stem-loop primers. Relative quantities (RQ) of the miRNA, measured by RT-qPCR, were calculated by the ddCt method using the Ref-miR as a reference, and a mix of synthetic miRNAs as a calibrator. Kaplan-Meier was performed for testing event and relapse-free-survival (EFS and RFS). Cox proportional-hazards regression was performed to investigate the relationship of the miRNA with other prognostic factors. Forty-nine of the 272 patients had an event (38 relapses, 2 second malignancies and 9 deaths). Optimal cutoffs for predicting an event (positive biomarker) was determined at < median level of miR-151-5p and < upper quartile level of miR-451 of whole population. Analysis of miR-1290 didn't continue due to nonsignificant association with EFS. Low levels (positive biomarker) of the miRNAs predicted worse EFS compared to high levels: miR-151-5p (75% vs. 89%, p=0.003) and miR-451 (79% vs. 92%, p=0.02). Combining miR‑151-5p/miR-451 to a single classifier led to a linear decrease in EFS with increasing number of positive miRNA: 0 positive (96%), 1 positive (86%), 2 positive (74%) (p=0.0005, logrank trend). Combined miR‑151-5p/miR-451 associated with PCR-MRD risk classification: 2 positive miRNA in 25/80 (31%) standard risk (SR), 50/123 (41%) medium risk (MR) and 11/13 (85%) high risk (HR), whereas <2 positive in 55/80 (69%) SR, 73/123 (59%) MR and 2/13 (15%) HR (p=0.002, chi2 for trend). The combined miR‑151-5p/miR-451 classifier (HR 2.0, 95%CI 1.3-3.3, p=0.004) was an independent predictor of EFS when testing in relation to white blood cell (WBC) count, age (1‑6 yrs. vs. >6 yrs.) and AIEOP-BFM final risk stratification. An incremental classifier was created by the summation of miR‑151-5p/miR-451 positive status (0, 1 or 2), WBC count 3 levels (1, 2 or 3), and age > 6 (0 or 1) leading to a score of 0 to 6. There was a linear decrease in EFS and RFS (p<0.0001) as the score increased. 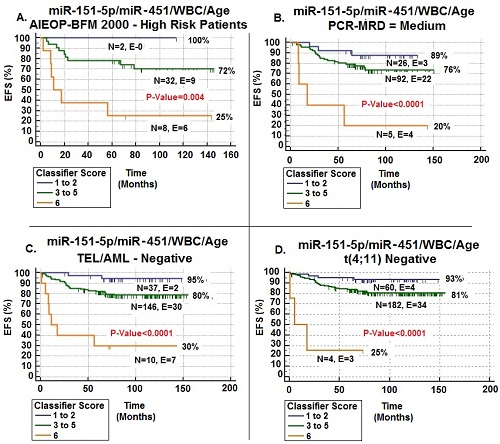 Sub-cohort analyses showed the predictive power of the classifier in AIEOP-BFM HR patients, PCR-MRD MR patients and patients negative for TEL/AML or t(4;11) mutations (Figure). The mir-151-5p/miR-451 classifier was confirmed as an independent prognostic factor for EFS and RFS of B-ALL patients from the AIEOP-2000 cohort. To confirm the prognostic independent value, these results should be validated in another independent cohort using this standardized method for the semi-quantification of miR-151-5p and miR-451.